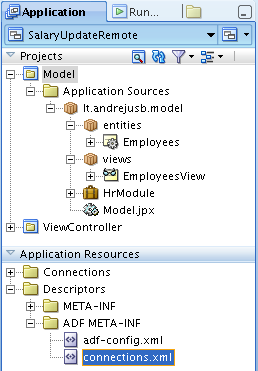 In Oracle Fusion 11g, JDeveloper provides great support for Application Integration Architecture (AIA) through Service-Enabled Entity Objects. 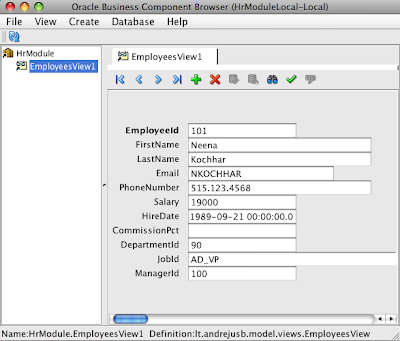 It allows to build Enterprise Composite Applications (ECA) in Oracle ADF. 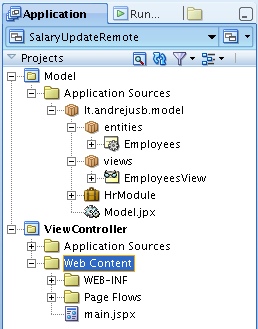 Developer now can implement Entity Objects directly based on View Objects from remote application, exposed through Web Service. This means we can expose and consume Web Services on Model level using ADF Business Components, this gives more centralized integration approach. Its especially important for AIA, when building ECA. 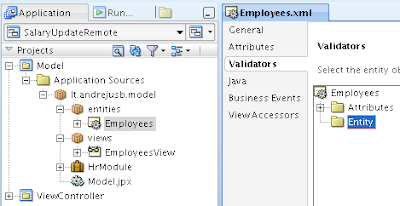 For more info, please read Section 11.3 Accessing Remote Data Over the Service-Enabled Application Module from Oracle Fusion Developer Guide. In this post I will describe some tips and tricks from my experience. 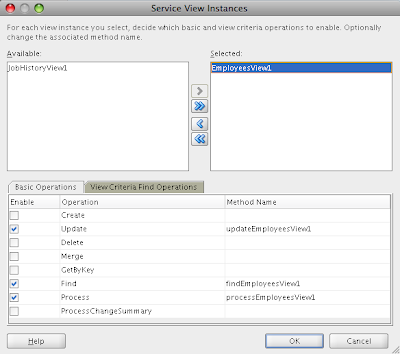 I have investigated Service-Enabled Entity Objects in greater detail and developed sample application. 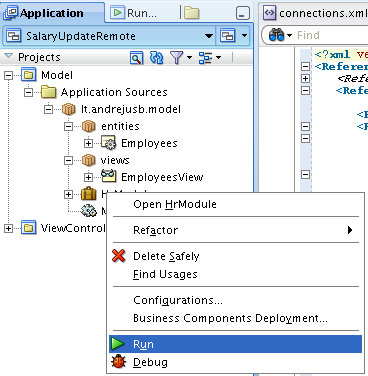 Sample is based on two JDeveloper 11g applications, first - SalaryUpdateRemote.zip is consuming remote Web Service on Entity Object level, second - SalaryControlService2.zip implements this Web Service. 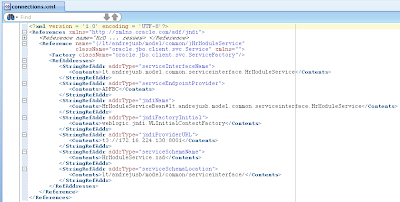 Application with Web Service implementation was developed in my previous post - Web Service Interface for ADF BC Application Module in Oracle Fusion 11g, where I have described how to expose through Web Service custom methods from Application Module implementation class. 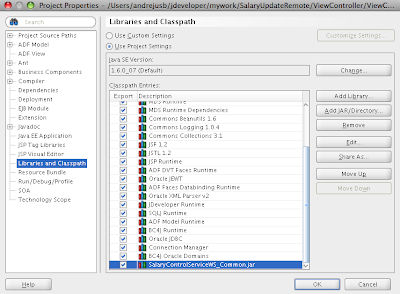 I have updated previously developed application in order to use it in current post, additionally have exposed View Object itself through Web Service. 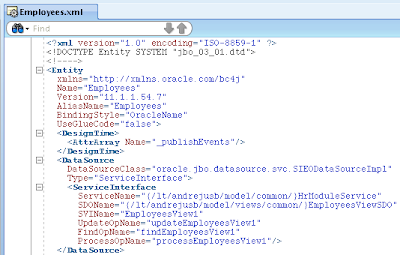 We need to note down WSDL URL, it will be needed soon, when we will define Entity based on Service Interface. Thats logical, because data will be retrieved on runtime through Web Service. 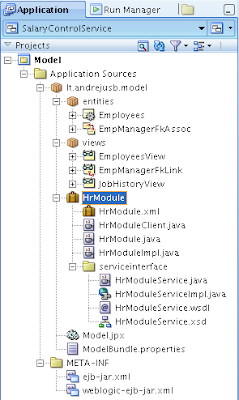 However, this means that Service-Enabled Entity Objects can't participate in joins and can be used only as primary objects. 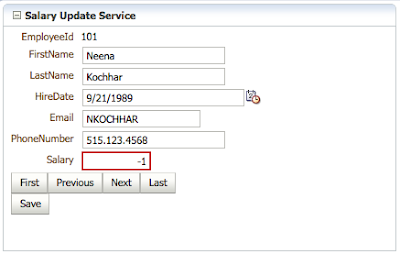 For more info read Section 11.3.7 What You May Need to Know About Service-Enabled Business Component Restrictions from Oracle Fusion Developer Guide. 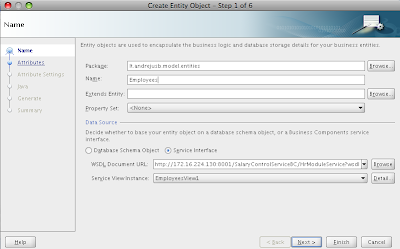 In jndiProviderURL I have specified IP and Port of my WebLogic domain extended with SOA support. 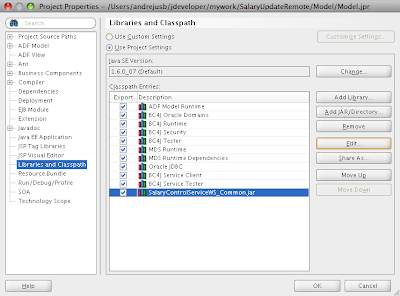 If its not selected, this means it will be not packaged into EAR there will be runtime exception when trying to access Web Service through Entity Object. 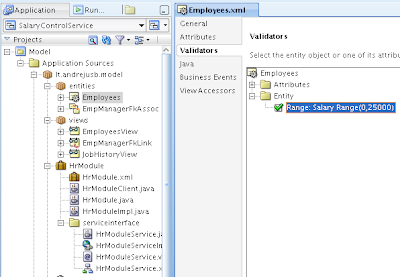 Este post ofrece un ejemplo de una nueva caracteristica que ofrece Jdeveloper para permtir la creacion de entidades en base a ViewObjects que pertenecen a aplicaciones remotas, las cuales son accedidas por medio de WEB Services. 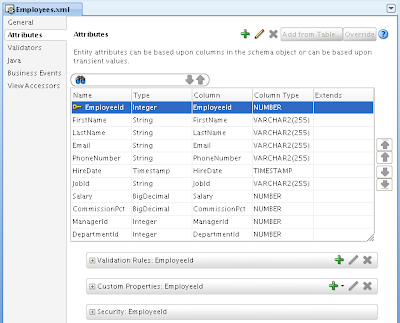 De esta manera nuestras aplicaciones pueden implementar rápidamente Enterprise Composite Applications (ECA) usando ADF. Nice post Andrejus. The article has been inspiring indeed. 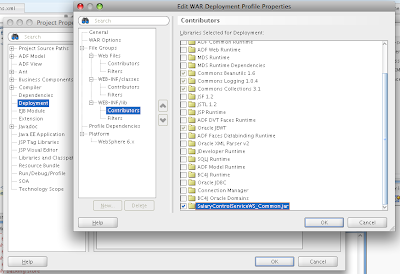 I was wondering what would be the solution if we were to use Webservices's WSDL only that are not from SDOs. Would WSDatacontrols be the only solution? Not sure how this is really useful... Wow! 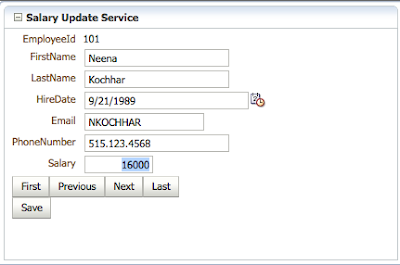 you can have an Oracle Web Service client talk to an Oracle web service! Not useful... 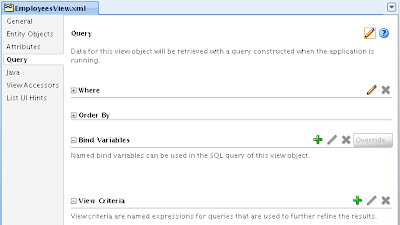 Please provide an example that backs an Entity Object with a service that provides a complex return from something other than an Oracle service. That would be more helpful and a real world use case... this is a toy use case. Firstly you should learn to be polite and then start commenting. This is my person blog and I post use cases I'm interested in and believe they will be useful to others. 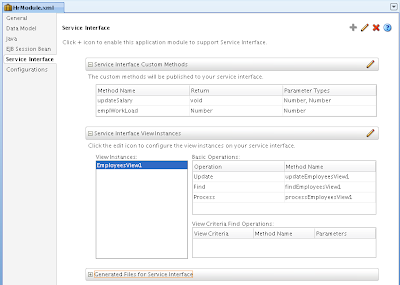 This specific use case describes how to expose and integrate ADF BC through Web Service across your system application. Do you have any suggestion to resolve this problem? Thank you! the filtering had problem with ADF 11.1.2.2 and no problem with 11.1.2.4 but the sorting doesn't work in both version even with the latest version of ADF, 12.1.3. We need a work-around for the sorting on the table that get data from service-enable objects. This post and the previous one (and definitely the next) are grouping many experiences together showing the whole picture.